Abbottabad Water and Sanitation Services Company Jobs Via NTS has been announce. Last date to apply is Friday, 28th December 2018. WSSCA was established in 2015 by the government of KPK under section 42 of companies ordinance 1984. It provides integrated yet improved drinking water, Sanitation, and Solid waste management services in District Abbottabad. The setup is incorporated under one corporate entity. These all services are being provided by various government entities such as Tehsil Municipal Administration (TMA) and Public Health Engineering Department (PHED). This configuration will greatly enhance the overall planning and service delivery in the city by making infrastructure development, Operations and maintenance more efficient and effective. WSSCA is looking for dynamic professionals to fill the junior / senior management positions. The pay packages for the jobs in WSSCA is market base attractive salary depending upon exposure of candidates and experience as well. All those candidates who are eligible for the WSSCA Jobs must apply to avail this golden opportunity. 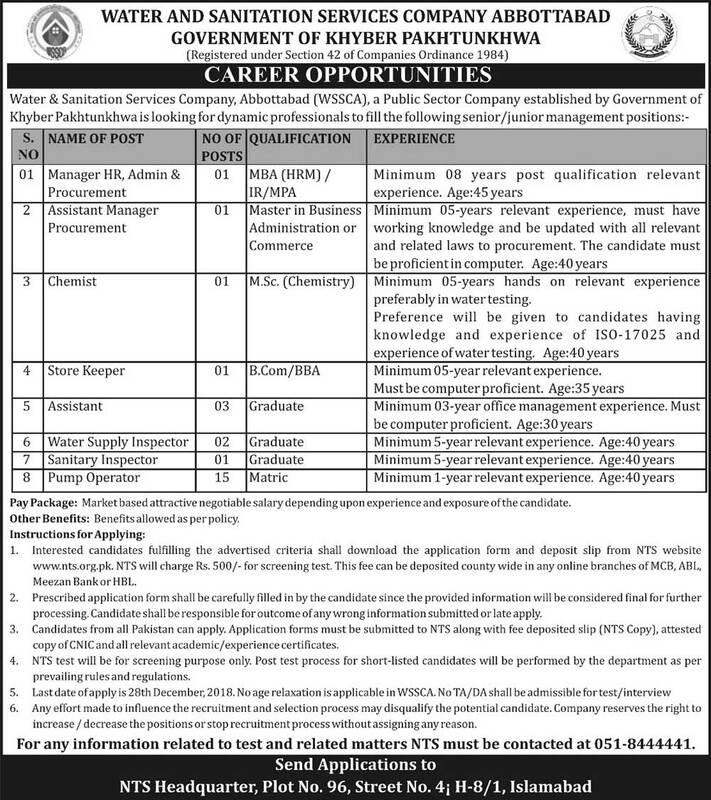 Applying procedure as well as other requirements for Water and Sanitation Services Company Abbottabad Jobs Via NTS are mention below. Applicants can apply from all over Pakistan.